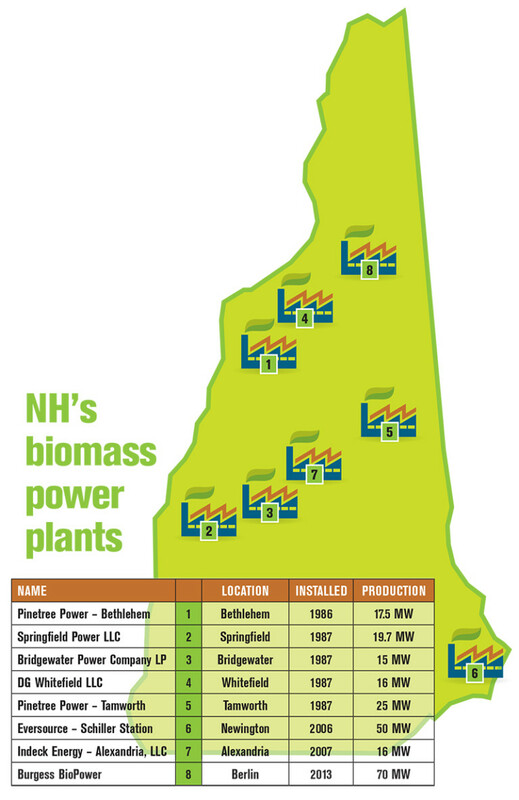 Editor’s Note: Glenn Rosenholm, a public affairs specialist with the U.S. Forest Service, Northeastern Area State & Private Forestry, recently conducted interviews with representatives of three biomass demonstration projects at county complexes in New Hampshire. Those interviewed were: Jim Oakes, maintenance superintendent for the Grafton County Complex; John Cressy, facilities director for the Sullivan County Complex; and Jude Gates, director of facilities, planning and IT for the Rockingham County Complex. Q. When did your biomass plant go online? Oakes: The project was put online in September 2013. It was never anticipated to run in the summertime. We planned to run it from October through May each year. However, we determined that we have sufficient load to run it year-round. Gates: The first boiler went online in June 2012 and the second went online in March 2013. Q. What kind of a plant is it? Is it heat only or heat and power? Cressy: Combined heat and power. Gates: It is heat only. Q. What kind of output does it produce? Oakes: It’s rated at 8 to 8.5 million BTUs. Cressy: It’s a 5 million BTU boiler with a designed peak steam flow of 5,200 pounds per hour. Gates: Boiler number one is 8.35 million BTUs and boiler number two is 4.18 million BTUs. Q. Are you having any problems finding fuel wood? Cressy: No. We’ve had no problem getting fuel, and 90 percent of our fuel wood comes from within 10 miles of our facility. Sometimes for different reasons we might end up getting some chips that are too big for our screen, and we have to manually feed them into the boiler. Gates: No, we signed a five-year contract when we started up and we’ve had no problem at all. Q. Would you say your operation runs sustainably? Cressy: Yes, wood is a very sustainable, renewable fuel source. Gates: Yes, I’m told there are more trees in New Hampshire now than when the Pilgrims landed. We didn’t just jump into biomass energy. We looked into the issue before we made a decision. Q. Has your plant operated as designed and intended? Oakes: For the most part, it has. We did have some startup issues with some pressures. Cressy: It was very reliable all winter. We couldn’t be more pleased. We’re running it this summer, however it’s been more of a learning curve to run it during the summer time. Q. What problems, if any, did you have to work out to get it running at optimal efficiency? Oakes: The plant was designed to run at 30 PSI. What we found was when we started it, the pressure exceeded that and started blowing pressure relief valves on adjoining boilers. Cressy: Our challenge is to fine-tune the system so that we can run it all summer and generate electricity. Gates: We had more of a learning curve in operating a biomass plant than problems to overcome. Q. Have those problems been resolved since then? Cressy: It’s a work in progress. Q. Overall, how satisfied are you with the product and its effects? Oakes: Very satisfied. We determined that our savings were about $150,000 this year, which doesn’t even factor in for a full year of savings. For next year we anticipate our savings to be around $175,000 – $200,000. Cressy: I’m 90 percent pleased, and we’re just trying to figure out how to operate it optimally in the summer. We anticipate a $300,000 savings this year over last year, when we burned $500,000 worth of fuel oil and propane. Gates: Very satisfied. We really do love our biomass plant. We give tours, we show them our savings. Everyone likes it. We’re very happy with it. We saved $500,000 in our first year compared to burning oil. Q. Would you recommend a plant like yours to someone else? Cressy: Absolutely, I have already several times. I’d recommend many types of biomass plants to people. Gates: Yes. I’ve made that recommendation several times. Q. Would you do anything different if you had to do it again? Oakes: Yes. In the area of chip delivery, our chip bunker’s apron does not extend far enough into the bunker, and in turn it creates spillage issues. I would get a deeper apron so that it spreads the chips farther back into the bunker. Cressy: The only thing I would really look at differently is the wood chip screening system. You do your best guesstimate as to how much time it will take you to run these things. Going down the road, it will take more time than we anticipated. Instead of an hour or two a day, it might take us three hours a day to run the plant. Gates: Not substantially, no. The only thing I might recommend for our plant would be to install a modulating feed water valve at the beginning to provide water at different volumes. Q. How do you feel about your pollution output? Oakes: I feel fine about it. The state has set standards, and we run well below that. On a warm day, you can’t even see any exhaust. When we first started it, people weren’t aware that it was running because nothing could be seen coming out of the smoke stack. Cressy: Real good. We’ve done something unique to the industry on this front. We’re adding a belt filter to the original design of the system. As a result, our system will be so clean it will allow us to earn renewable energy credits. Gates: Our multi-cyclones are doing the job. I don’t think we have any emissions issues.